If you’re fed up of seeing the same logos and slogans on t-shirts and want something more personal, you’ll love the concept of the I Love Boxie t-shirts. 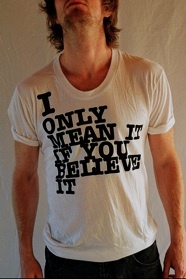 I Love Boxie, a London-based t-shirt design company, rebels against using clothing as a way of advertising brands. Instead they want the clothing to represent the wearer themselves. You could say they are providing a way to advertise yourself. They make T Spoke (bespoke) t-shirts for which you can email them a story from your life and from that one line will be taken and printed onto the t-shirt. It really could be anything. The result: a t-shirt that actually means something. The founder of the company is a writer called Moxie. She says “Everyone has a story, and everyone should have it put on a t-shirt. You look at a person and judge them in two seconds, the t-shirt says, ‘there’s more to me than what I’m wearing’.” She understands that in its own way the company is acting a bit like a self-help group. She’s also planning to make a film featuring the stories of some of the t-shirt’s creators. Models Direct think they’re great, what better way to express your happiness, sadness or anger than having it printed across your chest! They’re pretty affordable, £32 or $43 (and this is coming from me, someone who refuses to pay more than a tenner for a t-shirt). If you were to look at supermodel Erin Wasson’s CV you’d be impressed. In her 27 years she has walked international runways for some of the top designers, is an occasional stylist for Alexander Wang, is a favourite with some amazing photographers and has now turned to designing, directing her own jewellery line, LowLuv, and a womenswear collection. She even worked alongside Justin Timberlake in the multimedia campaign for his clothing line William Rast. Wasson grew up in Texas, and believes this southern upbringing has directly influenced her success in the industry. “You can’t take the Texas out of the girl,” the supermodel told Teen Vogue. “I wouldn’t have gotten this far in the fashion world if I didn’t have a little bit of that Southern hospitality in me.” Read articles about the model and you will be sure to find her endearing and charming personality mentioned. Erin’s modelling career began when her father entered her in Kim Dawson’s Modelsearch. It was 1997 and the first year of the competition, which Erin ultimately won. She left the south and started a new life in New York. Being thrown straight into the deep end, Erin had her first campaign in 2002 for Dolce & Gabbana. Erin has appeared on the front cover of fashion magazines internationally, including Vogue, Esquire and Elle. One factor in her success is her versatility when it comes to campaigns; Erin has proved popular in both high fashion and commercial advertisements. She has an extensive portfolio, too long to list, but it includes fashion giants Gucci, Chanel and Versace. In her spare time, the former ‘sports freak’ enjoys surfing and snowboarding. This directly influenced the model’s decision to design for skate and surf fashion lifestyle brand, RCVA. The end result, Erin Wasson x RCVA, is a stylish but understated collection that reflects the model’s own laidback style. Erin also dabbled in a bit of acting as part of the William Rast campaign, starring in short films as Justin Timberlake’s love interest. Ladies, if you weren’t jealous already, no doubt you are now! For all the teens who want to stay on top of this season’s trends – and parents buying for them – here’s all you need to know about what’s set to be cool throughout autumn and winter. Some of these items will make fab Christmas presents! Statement Scarf. Wear it bright and with pretty much anything, this is a key item for trendy teens over the coming months. Military Jacket. This season’s nod to King of Pop Michael Jackson, who popularised the item you will see everywhere over the coming months. There are loads of alternatives to choose from on the high street so make a statement in your favourite. Boots. The look for boots this year is taller than the ‘shoe-boot’ we have become accustomed to. Up to the knee, neutral flats are most flattering and we love them in suede. Shoulder detail. On Balmain style frocks and tops or sharp-shouldered blazers and jackets, this 80s look is huge – so why not embrace the revival. Woollen Beanie hats in this season’s berry shades. They look fab and are really toasty! Printed and patterned tights to help you keep warm and look great. These tights are an easy way to add interest to your outfit and will look great with the shorter hemline dresses that are going nowhere this season despite the colder weather. Tweed. Get classy in tailored tweed. Skirts, shorts and blazers are all bang on trend for autumn and you don’t have to be posh to wear them! Long sleeved mini-dresses. Perfect with your patterned tights and flat knee-high boots! Studded handbags. For an instantly more edgy look try a rock chic style studded bag – great paired with legging jeans.